Geir O Pedersen is known as a “super diplomat” from Norway with high standing at the United Nations. It’s therefore no great surprise that he’d be tapped to become UN Secretary General António Guterres’ Special Envoy for Syria. 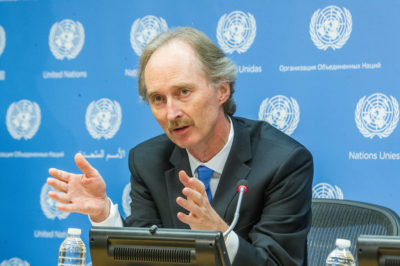 The UN announced that Pedersen “brings to this position decades of political and diplomatic experience.” In addition to being Norway’s ambassador to the UN from 2012 to 2017, he has also served as the UN’s “special coordinator” for Lebanon and as a personal representative of the UN secretary general for Southern Lebanon. He’s also been Norway’s representative to the Palestinian Authority and was a member of the Norwegian team in the negotiations that led to an historic agreement between the Palestinians and Israel in 1993. There’s no question the 63-year-old Pedersen has lots of experience in the Middle East that can now help him tackle the job of laying the groundwork for what the UN calls an “inclusive and credible political solution” in war-torn Syria. “He’s known as a man who can speak with everyone,” Profesor Iver Neumann, a Norwegian politial scientist and social anthropologist, told news bureau NTB on Thursday. Neumann said Pedersen “has done everything right in the UN system” and also possesses “extremely good abilities” as a diplomat. Norwegian Foreign Minister Ine Eriksen Søreide claimed it was “gratifying” that “one of our foremost diplomats” has been given such an important job in Syria. It means, however, that Norway now needs to suddenly find a replacement for Pedersen, who most recently has been serving as Norway’s ambassador to China. That won’t be easy, although Pedersen told Norwegian Broadcasting (NRK) on Thursday that Chinese officials had expressed their full support for his candidacy as UN Special Envoy for Syria. Pedersen had been transferred from his post as Norway’s ambassador to the UN to become Norway’s new ambassador to China. Norway’s foreign ministry needed one of its best diplomats in Beijing after a six-year diplomatic freeze between Norway and China (over the awarding of the Nobel Peace Prize to Chinese human rights activist Liu Xiaobo) finally thawed. Pedersen moved to Beijing just last year and also was able to finally relieve Svein Ole Sæther, who had held the post for an unusually long nine years, five of them in overtime. Newspaper Aftenposten has reported that Norway hadn’t dared bring Sæther home when his term was up, because of fears Chinese officials angry over the Peace Prize would not accept a new Norwegian ambassador. Sæther also had a large network of contacts in China that was helpful during the difficult diplomatic freeze. Aftenposten reported that Pedersen, approaching retirement age, himself had applied to be ambassador in either Denmark or Rome when his term in New York was due to expire in the summer of 2017. He was called upon to go to Beijing instead. Now he’s been called to go to Syria and try to end seven years of civil war. He told NRK on Thursday that he couldn’t turn down the challenge.